Slowly but surely, Pau Gasol walked down a Staples Center hallway amid a cloud of uncertainty. It went beyond whether the poor play will ever stop after the Lakers’ 110-100 loss Friday to the Charlotte Bobcats at Staples Center marked the team’s sixth consecutive defeat and 12th loss in 15 games through January. Gasol said he also will receive an MRI on Saturday after experiencing more pain in his injured right groin. 1. The Lakers defense remains a never-ending issue. Attention players who love to pad their stats. Attention fantasy basketball owners looking for a quick fix to their lineup. Attention general managers who want to showcase their players as trade bait. All three parties will receive their wish when they match up against the Lakers’ defense, namely, because it doesn’t exist. The Charlotte Bobcats rank 28th overall in total offense (94.1) and played without star guard Kemba Walker because of a sprained left ankle. 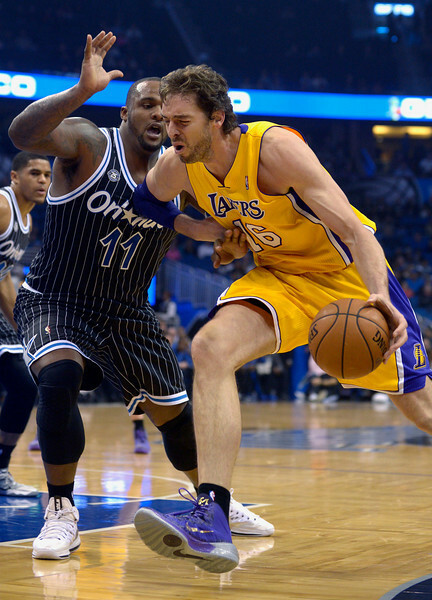 Yet, Charlotte still looked like an offensive powerhouse against the lowly Lakers. The Lakers looked weak in every way imaginable. Al Jefferson looked like an All-Star and a physical force with 40 points and 18 rebounds. TThe Bobcats outmuscled them on the boards (49-41) and in points in the paint (64). Even thought the Lakers committed eight turnovers, the Bobcats still dominated the open floor because the Lakers rarely sprinted back on defense. Whether the Lakers played small or big, their defensive issues remain the same. And they’ve offered no signs the broken record will stop. Anytime he sits on the bench or by his locker rooms stall, Jordan Farmar looks restless. He’s nursed a torn hamstring for the past month, and the only solution toward letting it heal has involved doing nothing. Farmar may have finally ended his withdrawal symptoms from basketball by participating in Thursday’s practice. But it appears the Lakers’ guard will still have to wait before returning. Lakers coach Mike D’Antoni sounded skeptical Farmar could play Tuesday in Minnesota as the beginning of a three-game trip. 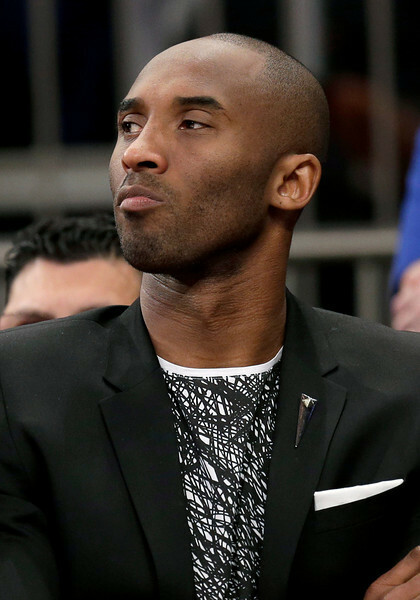 “Farmar is further and wants to be careful with him because of the last time what happened to him,” D’Antoni said. It’s possible both Steve Nash and Steve Blake play as early as Tuesday depending on how their respective back and right elbow feel during practices on Saturday, Sunday and Monday. 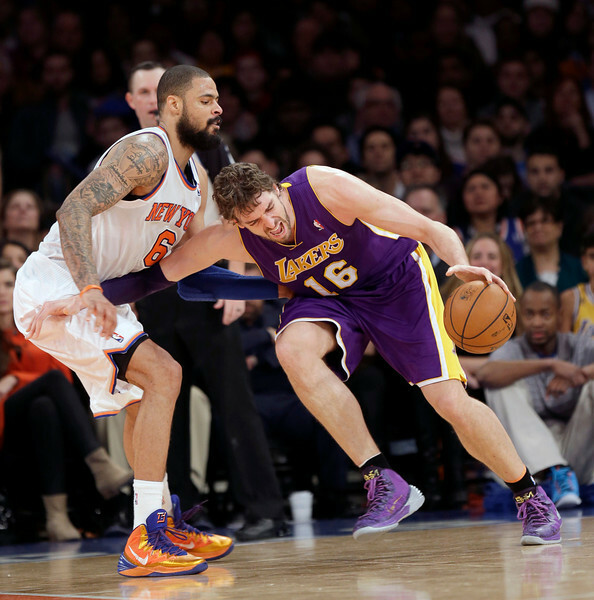 But Farmar’s situation appears a bit dicier because of the nature of his torn left hamstring. He also suffered another hamstring injury that kept him sidelined for 10 games. Farmar lasted only four more games before tearing his hamstring in a different area. Though a groin injury in recent weeks has worsened enough to keep him active in only part of Fridays’ shootaround, Pau Gasol is expected to play when the Lakers (16-30) host the Charlotte Bobcats (20-27) Friday at Staples Center. Lakers coach Mike D’Antoni disclosed Gasol is wearing a “device” on his the big toe of his left foot after suffering a moderate strain in that area two weeks ago. Gasol didn’t speak to reporters on Friday, but he said following Thursday’s practice that the toe injury contributed to the groin injury because he felt forced to compensate. D’Antoni also said Lakers guard Jodie Meeks will play tonight against Charlotte despite nursing a sore right foot. Meeks has averaged a career-high 14.6 points on 45.4 percent shooting this season because of improved outside shooting, defensive hustle and finishing. Meanwhile, Gasol has become largely efficient this month, averaging 20.6 points on 50.9 percent shooting 12.1 rebounds in 35.1 minutes per game through 14 contests. That marks a sharp increase from his totals in November (14.9 points on 43 percent shooting and 10.3 rebounds) and December (15.5 points on 46 percent shooting and 7.8 rebounds). Yet, Gasol wasn’t named as a reserve to this year’s All-Star team. The Eastern Conference only boasts five teams with winning records, including the Indiana Pacers (35-10), Miami Heat (32-13), Toronto Raptors (24-21), Atlanta Hawks (23-21) and Chicago Bulls (23-22). The lone Western Conference teams without .500 records include the New Orleans Pelicans (19-26), Utah Jazz (16-29), Lakers (16-30) and Sacramento Kings (15-30). Still, it didn’t help that Gasol suffered inconsistency this season. Magic Johnson backtracked, pivoted and handed off an assist. This doesn’t dazzle as much as his signature passes during the “Showtime Era”. But it still could cause one to shake their head in surprise. Magic Johnson has criticized the Lakers for everything imaginable. Their poor defense. The Lakers’ decision to hire Mike D’Antoni last season over Phil Jackson. The direction executive vice president of basketball personnel Jim Buss has taken this franchise. The losing, too. But Johnson has vowed he won’t do that anymore. Phil Jackson wondered aloud the logic behind the Lakers’ front office making a move, and this time it didn’t involve him lamenting getting pass over in favor of Mike D’Antoni last season to coach. Instead, Jackson questioned why the Lakers would sign Kobe Bryant to a two-year, $48.5 million extension considering how that compromises the team’s cap space under a harsher labor deal. “They paid him more than I would have gone for,” Jackson said in an interview on NBA TV that aired on Thursday. But Jackson, who won five of his 11 NBA championships with Bryant, still understood the value he brings despite playing only six games first because of a torn left Achilles tendon and later because of a fractured left knee. After showcasing plenty of star power in their storied history, the Lakers have mostly fielded a roster of nameless players. Couple that reality with the Lakers’ persistent losing, and they won’t feature any players in the NBA All-Star game for the first time since the 1995-96 season. Kobe Bryant was voted to start in what would’ve become his 15th All-Star appearance despite appearing in only six games because of a injured left Achilles tendon and then a fractured left knee. But with Bryant expected to be sidelined for at least three more weeks, Bryant isn’t healthy enough even to make a token appearance. In what’s become a persisting theme for this disappointing season, the Lakers’ flurry of point guards returning to practice coincided with one of their key players staying sidelined. Pau Gasol missed Thursday’s practice and remained confined to individual drills after a groin injury worsened in the Lakers’ loss Tuesday to the Indiana Pacers. Although the Lakers (16-30) consider Gasol probable for tomorrow’s game against the Charlotte Bobcats (20-27) at Staples Center, the Lakers forward sounded as if this injury could affect his play. After nursing most of the season without any traditional point guards, the Lakers suddenly have plenty of them. Both Steve Nash, Steve Blake and Jordan Farmar participated in Thursday’s practice, giving the team a sudden jolt of hope in an otherwise disastrous season. 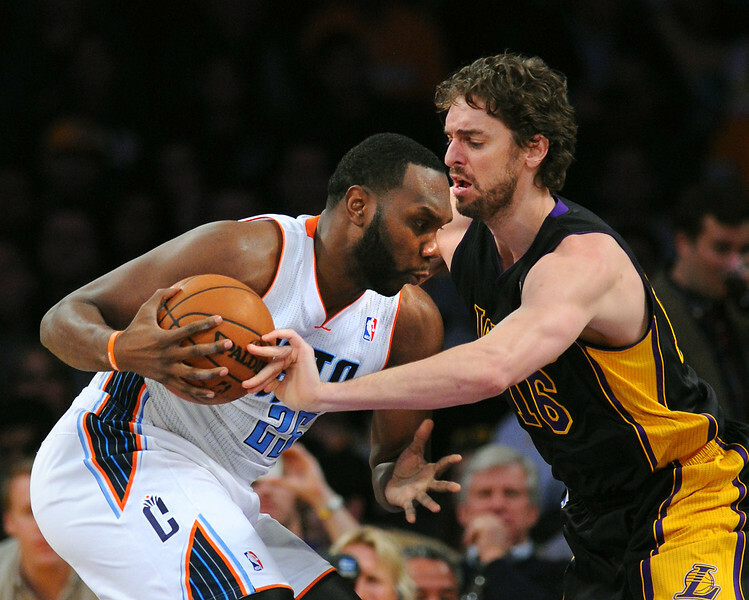 Neither players will play when the Lakers (16-30) host the Charlotte Bobcats (20-27) Friday at Staples Center. But Nash sounded the most optimistic that he could play in the Lakers’ three-game trip next week with stops in Minnesota (Tuesday), Cleveland (Wednesday) and Philadelphia (Friday) after missing 40 games because of persistent nerve issues in his back and hamstrings. Blake, who hasn’t played since Dec. 10 because of a hyperextended right elbow, no longer wears a brace. But he wore two bags of ice around his right arm and suggested he will have to rehab it. 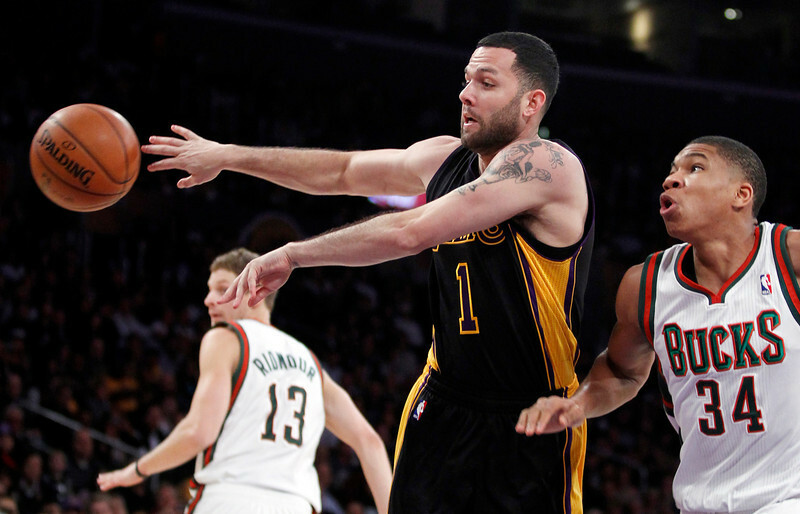 Farmar also sounded cautious after sitting out since Dec. 31 because of a torn left hamstring. Lakers forward Pau Gasol didn’t practice on Thursday because of a sore groin, but he was listed as probable against Charlotte after completing an individual workout. The Lakers are also listing shooting guard Jodie Meeks as probable because of a sore right foot. Kendall Marshall has done a good job at point guard since the Lakers signed him out of the D-League in December. He’s averaging 10.5 points and 9.3 assists in 17 games – 13 as the starter. But with the news Monday that three other point guards – Steve Nash, Steve Blake and Jordan Farmar – are close to returning from their respective injuries, one has to wonder what will happen to Marshall when they do. Marshall on Monday insisted he is not thinking about it. Marshall, out of North Carolina, is shooting 44.4 percent from the field overall, 47.9 percent (34 of 71) from 3-point range. Marshall and the rest of the Lakers tonight play host to the Indiana Pacers, who at 34-9 have the league’s best record.